In electric power generation a combined cycle is an assembly of heat engines that work in tandem from the same source of heat, converting it into mechanical energy, which in turn usually drives electrical generators. 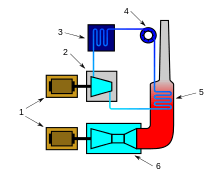 The principle is that after completing its cycle (in the first engine), the working fluid of the first heat engine is still low enough in its entropy that a second subsequent heat engine may extract energy from the waste heat (energy) of the working fluid of the first engine. By combining these multiple streams of work upon a single mechanical shaft turning an electric generator, the overall net efficiency of the system may be increased by 50–60%. That is, from an overall efficiency of say 34% (in a single cycle) to possibly an overall efficiency of 51% (in a mechanical combination of two cycles) in net Carnot thermodynamic efficiency. This can be done because heat engines are only able to use a portion of the energy their fuel generates (usually less than 50%). In an ordinary (non combined cycle) heat engine the remaining heat (e.g., hot exhaust fumes) from combustion is generally wasted. Combining two or more thermodynamic cycles results in improved overall efficiency, reducing fuel costs. In stationary power plants, a widely used combination is a gas turbine (operating by the Brayton cycle) burning natural gas or synthesis gas from coal, whose hot exhaust powers a steam power plant (operating by the Rankine cycle). This is called a Combined Cycle Gas Turbine (CCGT) plant, and can achieve a best-of-class real (HHV - see below) thermal efficiency of around 54% in base-load operation, in contrast to a single cycle steam power plant which is limited to efficiencies of around 35–42%. Many new gas power plants in North America and Europe are of the Combined Cycle Gas Turbine type. Such an arrangement is also used for marine propulsion, and is called a combined gas and steam (COGAS) plant. Multiple stage turbine or steam cycles are also common. Other historically successful combined cycles have used hot cycles with mercury vapor turbines, magnetohydrodynamic generators or molten carbonate fuel cells, with steam plants for the low temperature "bottoming" cycle. Bottoming cycles operating from a steam condenser's heat exhaust are theoretically possible, but uneconomical because of the very large, expensive equipment needed to extract energy from the small temperature differences between condensing steam and outside air or water. However, it is common in cold climates (such as Finland) to drive community heating systems from a power plant's condenser heat. Such cogeneration systems can yield theoretical efficiencies above 95%. Gas turbines of about 150 MW size are already in operation manufactured by at least four separate groups – General Electric and its licensees, Alstom, Siemens, and Westinghouse/Mitsubishi. These groups are also developing, testing and/or marketing gas turbine sizes of about 200 MW. Combined cycle units are made up of one or more such gas turbines, each with a waste heat steam generator arranged to supply steam to a single steam turbine, thus forming a combined cycle block or unit. Typical Combined cycle block sizes offered by three major manufacturers (Alstom, General Electric and Siemens) are roughly in the range of 50 MW to 500 MW and costs are about $600/kW. The heat recovery boiler is item 5 in the COGAS figure shown above. No combustion of fuel means that there is no need of a fuel handling plant, and it is simply a heat exchanger. Exhaust enters in super heater and the evaporator and then in to economiser section as it flows out from the boiler. Feed water comes in through the economizer and then exits after having attained saturation temp in the water or steam circuit. Finally it then flows through evaporator and super heater. If the temperature of the gases entering the heat recovery boiler is higher, then the temperature of the exiting gases is also high. In general in service Combined Cycle efficiencies are over 50% on a lower heating value and Gross Output basis. Most combined cycle units, especially the larger units, have peak, steady state efficiencies on the LHV (marketing figure) basis of 55 to 59%. Research aimed at 1370 °C (2500 °F) turbine inlet temperature has led to even more efficient combined cycles and nearly 60% LHV efficiency (54% HHV efficiency) has been reached in the combined cycle unit of Baglan Bay, a GE H-technology gas turbine with a NEM 3 pressure reheat boiler, utilising steam from the HRSG to cool the turbine blades. Siemens AG announced in May 2011 to have achieved a 60.75% net efficiency with a 578 megawatts SGT5-8000H gas turbine at the Irsching Power Station. The most recent General Electric 9HA can attain 41.5% simple cycle efficiency and 61.4% in combined cycle mode, with a gas turbine output of 397 to 470MW and a combined output of 592MW to 701MW. Its firing temperature is between 2,600 and 2,900 °F (1,430 and 1,590 °C), its overall pressure ratio is 21.8 to 1 and is scheduled to be used by Électricité de France in Bouchain. On April 28, 2016 this plant was certified by Guinness World Records as the worlds most efficient combined cycle power plant at 62.22%. The Chubu Electric’s Nishi-ku, Nagoya power plant 405MW 7HA is expected to have 62% gross combined cycle efficiency. By combining both gas and steam cycles, high input temperatures and low output temperatures can be achieved. The efficiency of the cycles add, because they are powered by the same fuel source. So, a combined cycle plant has a thermodynamic cycle that operates between the gas-turbine's high firing temperature and the waste heat temperature from the condensers of the steam cycle. This large range means that the Carnot efficiency of the cycle is high. The actual efficiency, while lower than this, is still higher than that of either plant on its own. The actual efficiency achievable is a complex area. The electric efficiency of a combined cycle power station, if calculated as electric energy produced as a percentage of the lower heating value of the fuel consumed, may be as high as 58% when operating new, i.e. unaged, and at continuous output which are ideal conditions. As with single cycle thermal units, combined cycle units may also deliver low temperature heat energy for industrial processes, district heating and other uses. This is called cogeneration and such power plants are often referred to as a Combined Heat and Power (CHP) plant. An integrated gasification combined cycle, or IGCC, is a power plant using synthesis gas (syngas). Syngas can be produced from a number of sources, including coal and biomass. The system utilizes gas and steam turbines, the steam turbine operating off of the heat leftover from the gas turbine. This process can raise electricity generation efficiency to around 50%. Thermodynamic benefits are that daily steam turbine startup losses are eliminated. Major factors limiting the load output of a combined cycle power plant are the allowed pressure and temperature transients of the steam turbine and the heat recovery steam generator waiting times to establish required steam chemistry conditions and warm-up times for the balance of plant and the main piping system. Those limitations also influence the fast start-up capability of the gas turbine by requiring waiting times. And waiting gas turbines consume gas. The solar component, if the plant is started after sunshine, or before, if we have heat storage, allows us to preheat the steam to the required conditions. That is, the plant is started faster and we consume less gas before achieving operating conditions. Economic benefits are that the solar components costs are 25% to 75% those of a Solar Energy Generating Systems plant of the same collector surface. The first such system to come online was the Archimede solar power plant, Italy in 2010, followed by Martin Next Generation Solar Energy Center in Florida, and in 2011 by the Kuraymat ISCC Power Plant in Egypt, Yazd power plant in Iran, Hassi R'mel in Algeria, Ain Beni Mathar in Morocco. Some versions of the Wright R-3350 were produced as turbo-compound engines. Three turbines driven by exhaust gases, known as power recovery turbines, provided nearly 600 hp at takeoff. These turbines added power to the engine crankshaft through bevel gears and fluid couplings. ↑ "Natural Gas reserves". BP. Retrieved 19 September 2011. ↑ "The difference between LCV and HCV (or Lower and Higher Heating Value, or Net and Gross) is clearly understood by all energy engineers. There is no 'right' or 'wrong' definition.". Claverton Energy Research Group. ↑ "ENEL a Priolo inaugura la centrale "Archimede"". ENEL. 14 July 2010. ↑ "Iran - Yazd integrated solar combined cycle power station". Helios CSP. 21 May 2011. Applied Thermodynamics ISBN 9788185444031,R Yadav., Sanjay., Rajay, Central Publishing House, Allahabad. Sanjay, Y; Singh, Onkar; Prasad, BN (December 2007). "Energy and exergy analysis of steam cooled reheat gas-steam combined cycle". Applied Thermal Engineering. 27: 2779–2790. doi:10.1016/j.applthermaleng.2007.03.011.